At Bluff Creek Dental, we are dedicated to helping our patients maximum their insurance coverage and fully understand their benefit plan. Our knowledgeable Oklahoma City dentist and team have years of experience processing and filing insurance claims to ensure our patients receive the coverage they’ve invested in. If you’re new to our office, please don’t hesitate to give us a call or ask one of our friendly team members about your insurance coverage at your new patient visit. We’ll be happy to review your policy and help you better understand how specific treatments are covered. Studies indicate that cost is the main reason patients avoid visiting the dentist. Not just cost of preventive care, but they feel there are “surprise” costs or that they’ll be pressured into a service they can’t afford. Our team is dedicated to taking this anxiety away from our patients. We work hard to ensure our pricing is reasonable and affordable, and we are familiar with coverage and benefit plans for many dental insurance providers. We are an in-network dental office for many popular benefit plans. This means we’ve agreed to the price range laid out by the insurance plan, so you’ll receive the maximum coverage for your benefits. We know this can be confusing, but it’s actually pretty simple. Each dental insurance provider sets a price range for treatments that they consider to be fair. In-network providers agree to charge that price. 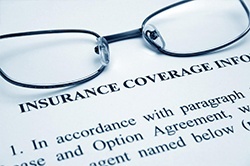 Patients then receive the percentage of coverage as outlined in their policy. Out-of-network insurance providers can charge any fee they deem reasonable, but the insurance provider still only covers the percentage of their set prices. Patients pay the difference between the charged price and the insurance-defined fair price plus their percentage of the treatment cost. Even if we aren’t in-network with your dental insurance provider, we’d be happy to process and file your claims. Our prices are extremely competitive, and we’ll do our utmost to help you receive the benefits you deserve for any treatment. If you are covered by an out-of-network insurer, we may not be as familiar with their coverage, so please feel free to bring your policy documents with you. It’s important to remember that every dental insurance plan is different. Your benefit plan is a personal agreement between you and your insurance provider. However, we are very familiar with insurance coverage, so part of our treatment planning process will include taking the time to review your dental insurance coverage. We’ll offer accurate estimates of benefit coverage and out of pocket costs. Our main goal is to take the mystery out of dental insurance. We put our years of experience to work to provide you with clear pricing without surprises.